Vermont is calling remote workers with a deal for them. The state just passed a new law that that pays workers to move there to work remotely. On Wednesday, the new legislation was signed into law by Governor Phil Scott. Eligible workers will receive as much as $5,000 per year and not more than $10,000 over a period of two years, through the new grant program in the state for remote workers. The money received can be used for qualified expense that include relocating costs, needed computer equipment as well as software, co-working memberships and internet access. Vermont’s population is both small and aging, according to the state’s commissioner for economic development Joan Goldstein. She said that the state recognizes there is a need to recruit people to live in the state and the new legislation is only one of the efforts. Inquiries are already being made by interested workers. For a worker to qualify, they must work full time for a business located outside Vermont, work primarily at their home or at a co-working space located in Vermont, and become a full-time Vermont resident on January 1, 2019 or after. Workers who are interested need to act fast. The funds are distributed on the basis of first come first served and the state has annual limits for the grants. In 2019, the total amount of grants cannot surpass $125,000. That cap will increase to $250,000 in 2020, but then returns to $125,000 for 2021. The labor market in the U.S. has thrived of recent, making it very difficult for businesses to retain workers. Data released by the government shows that people are not moving as much as they did previously. Companies are more creative and generous when competing for the best possible talent available. Some have increased pay and changed payroll practices, and others have increased employee benefits, such as offering to pay a student loan down or offer flexible schedules. However there could be tax implications if one lives in one state while working in another. Goldstein said the remote workers must pay Vermont income tax even though they earn the money in another state. 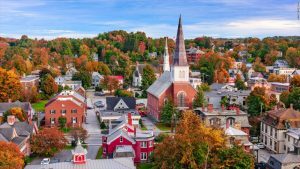 The idea overall is getting more people to live in Vermont because the tax base needs to be broadened. Taxes are also less in Vermont than in some other states such as New York.